My hair was just too thin for my comfort. I joined several hair forums and started watching Youtube for inspiration. I started rollersetting my hair everyweek (protective styles are WONDERFUL, but I'm not a constant bun/braidout type of person. I like to enjoy my hair!) After a few months, my hair shaped up ! Around 3 months post relaxer, it was about time to do my touch up, but I had fallen in love with how thick my hair was and was NOT willing to go back to thinner hair at all. It got to a really nice length and thickness ! I wasn't ready to part with the thickness though. 3 months later, I did a flat iron and decided that I no longer wanted to transition. 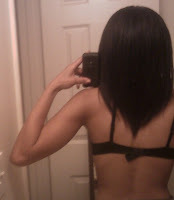 I completed my BIG CHOP on July 29, 2009 and it really felt great ! I did miss my length, and I still do now sometimes. I'm almost 6 months post big chop, and my hair is FINALLY at a comfortable length. 3 days ago, I did my first rollerset on my natural hair ! I am going to continue rollersetting/flexi-rodding my hair for the winter to help keep my hair much more manageable and detangled. Most of all, I LOVE how it stretches my hair !!! Shrinkage is really intense and frustrating sometimes. I'm hoping that rollersetting will also help my ends to stay moist since they can get very dry when you're natural !! Here is a pic of my hair rolled up for the first time. As I get the technique down, I will add pictures ! For now they are safely hidden on my hard drive *smile*. Wow! You've come a long way on your journey. Keep up the good work and I'll be checking in with you every couple of weeks. 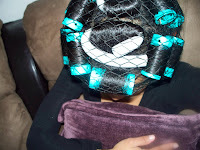 Nakeisha I can't wait to see the results of that rollerset when you do it !! !